Isn´t it weird sometimes what we remember about certain movies? I don´t know when it was, but I think it must have been a very long time ago, that I watched The Deer Hunter for the first time. Looking back the only thing I did remember was the Russian roulette scene and the cage that was submersed in water. I didn’t remember any combat scenes and nothing that went on before they volunteered or after they returned from the war. 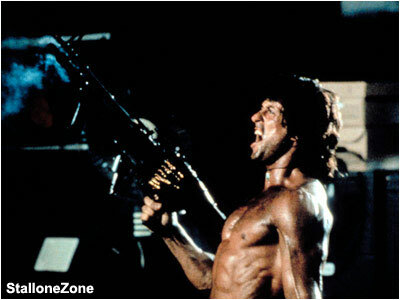 What actually happened is that my memory turned The Deer Hunter into a pure POW movie. I finally watched it again and was surprised. I saw a totally new movie. Powerful is the best word to describe it, even though this does it little justice. Sure, what I remembered was still there but it shrank considerably and took up less than a tenth of the whole movie. Strange I think, because since I have seen it again I must say, yes, the roulette scene, the whole POW part is maybe the most impressive but it is not the most important. And it is totally fictious. 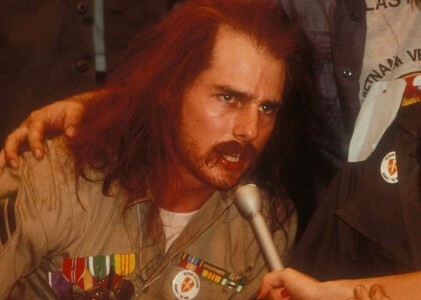 It is as if Michael Cimino had chosen to show the war in this way because he thought facts would not be drastic enough. 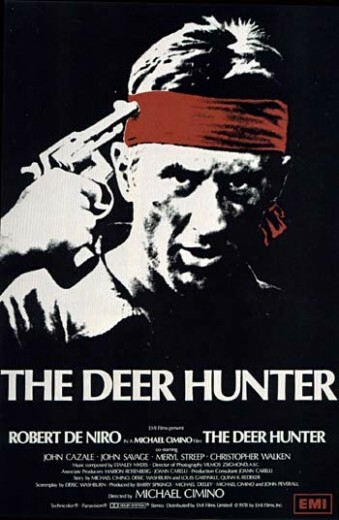 Looking at all the other Vietnam war movies that have been done since I must say that especially because of these scenes The Deer Hunter is not the best Vietnam war movie there is but it is one of the more original ones. And it is an extraordinarily good movie about a certain type of people and how they were affected by the war. What I will remember from now on is young men who live in a grim industrial town. They are second generation Russian immigrants who are enthusiastic and idealistic and want to fight for their country not knowing what they get themselves into. A bunch of friends for whom life only just begun and whose dreams will be shattered for ever. Who return having left the easy-going, careless “Deer Hunter”-personality behind. They are completely changed and broken and we ask ourselves at the end : is there still enough left of them to begin a new life? It is not my favourite Vietnam movie but it ranks high up among the 10 best as I stated before (see my list 10 Vietnam War Movies You Must See Before You Die ). What about you? Which is the part you like best about The Deer Hunter. Would it have been possible to leave the roulette part out altogether? How high would you rank it within the 10 best Vietnam war movies and how high within the best including every war/subgenre? Often when you ask someone who is their favourite actor especially men tend to name Robert de Niro. Surely his merits are undisputable still he did get on my nerves in several of his films since he´s got the habit of overacting and that way tends to turn into a parody of himself. I thought I´d seen many of his movies and knew that he was at least in two Vietnam related ones, The Deer Hunter and Taxi Driver. Somehow Jacknife sneakily escaped my attention. I saw it recently and must say, it would have been a pity not to see it and this for several reasons. (Check out the trailer in an older post). First, I think, it is one of de Niros´ best performances, second I think it is a very good attempt at showing the theme of the Vietnam vet. Post traumatic stress and so forth. Megs (de Niro) and Dave (Ed Harris) served in Vietnam together. They hadn´t seen each other for a while when suddenly, out of the blue, Megs invades Dave´s home to take him on a fishing trip. Unfortunately he realises he´s less than welcome. Dave showing every sign of full-blown alcoholism still blames Megs for the death of Bobby, the third guy they went to Vietnam with. Megs tries everything to cheer up Dave but fails completely. The fact that Megs begins a relationship with Martha (Kathy Baker), Dave´s sister doesn´t exactly improve anything. Even though at first it looks as things were not going well at all, Megs´ likeable character, his outgoing, eccentric ways liven up the brother and sister and ultimately transform them profoundly. The story is interwoven with flashbacks that show what went wrong in Vietnam where Megs was by far too gung-ho and shooting way too fast at everything. Sure, these are personal stories, character studies, no analyzing of the war as such or its political and social impact. 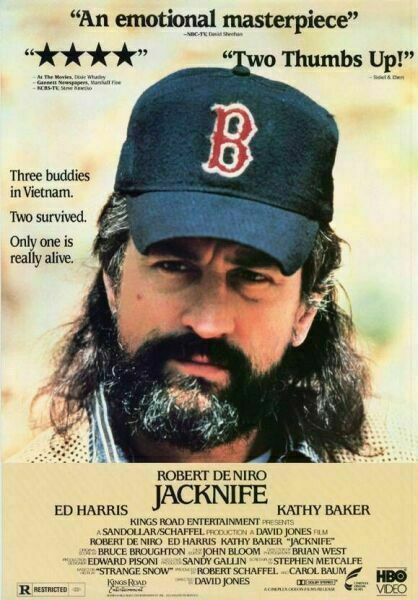 I just adored de Niro in this and understood again why so many think he´s one of the best actors alive.